I'm not what you would call a good baker. I don't measure flour correctly and I sometimes add--okay almost always add--a little more cinnamon and vanilla than what the recipe calls for. I always hear chefs on food shows talk about how they don't bake because they don't like the measuring and precision that goes into each batch of cookies. So I guess I am what you could call a novice-chef-who-bakes? I mean, I love baking, but I'm not an expert. 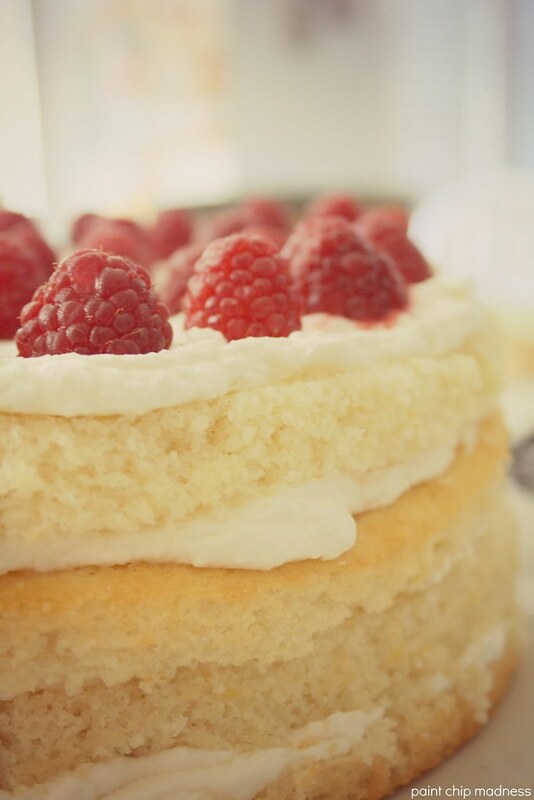 Fortunately, I've fallen in love with this fairly simple cake recipe. And I was even adventurous enough to substitute/add some different ingredients while baking this cake for Mother's Day. Adapted from Carol's Heavenly Cake (via allrecipes). Combine the sifted flour and baking powder in a bowl. Sift the two ingredients 3-4 times. In a second bowl, beat the egg whites until they are foamy (it shouldn't take too long). Next, gradually add 1/2 cup of the sugar to the egg whites, beating in between each addition. Keep beating until soft peaks form. In a third (your largest) bowl, cream the butter. Continue beating while gradually adding the remaining cup of sugar. When it's fluffy, alternate adding the dry ingredients and the milk, a little bit at a time. When the batter is smooth, add the vanilla, lemon zest, and lemon juice. Lastly, mix in the egg white mixture. Once all ingredients are combined, pour the batter into lined parchment paper pans. I used two round 9 x 9 pans but you can also use a 15 x 10 pan or three 8 inch round pans. Bake the cake(s) at 350 degrees for 30 minutes (if baking in one pan, the cake may take a little longer). The cakes should be lightly golden and a toothpick inserted in the center should come out clean. Let the cakes cool (at least ten minutes). Before removing it from the pan, use a plastic knife to loosen the edges. 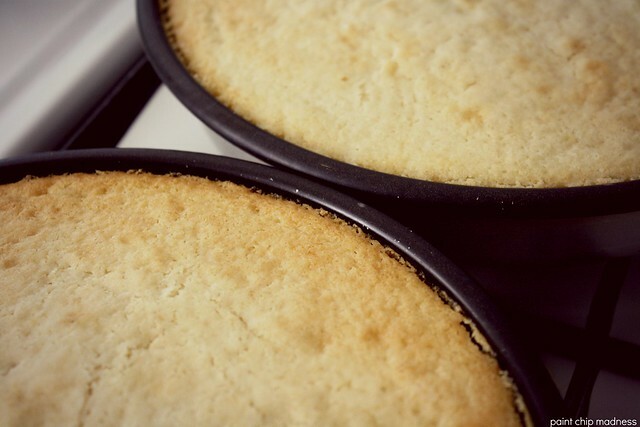 If you're layering the cakes (as seen in the photos), place a cooled cake onto a flat plate. Using a bread knife, slice the cake in two, creating two (now shorter) cakes. Repeat this process if you have multiple cakes. 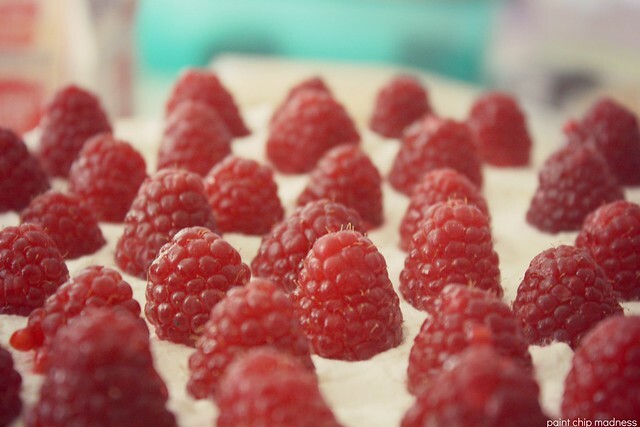 In between each layer, add whipped cream and raspberries. I recommend slicing them in half so the cake lays flatter in the end. 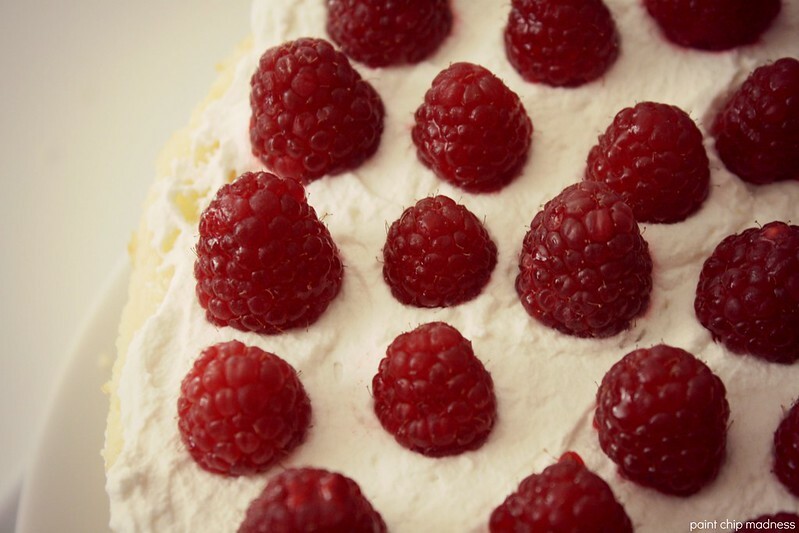 Top off the cake with whipped cream and raspberries on top.